R.I.P. 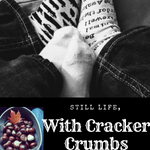 Readers Imbibing Peril #13 | Still Life, With Cracker Crumbs.. This is my favorite time of the year, where we wave goodbye to summer and ease our way into cooler weather, bonfires, apple orchards, pumpkins, cold weather clothes, and crunchy leaves. Oh yeah, and lets not forget yummy coffee drinks and hard cider! I simply love autumn and Halloween, and I am excited to participate in this challenge again! There are a few different ways to participate as well! Peril the First: Read four books from the previously mentioned classifications. Peril the Second: Read two books from the types. Peril the Third: Read one book. Peril of the Short Story: Read some spooky short stories – E.A. Poe or Shirley Jackson would do! Peril on the Screen: Something on a screen large or small, a movie or a television show, that is seasonally appropriate! I began reading the Christie book last night and I am already hooked! Yes! My bookish goal for today is to get a mini reading plan together of fall and scary reads!